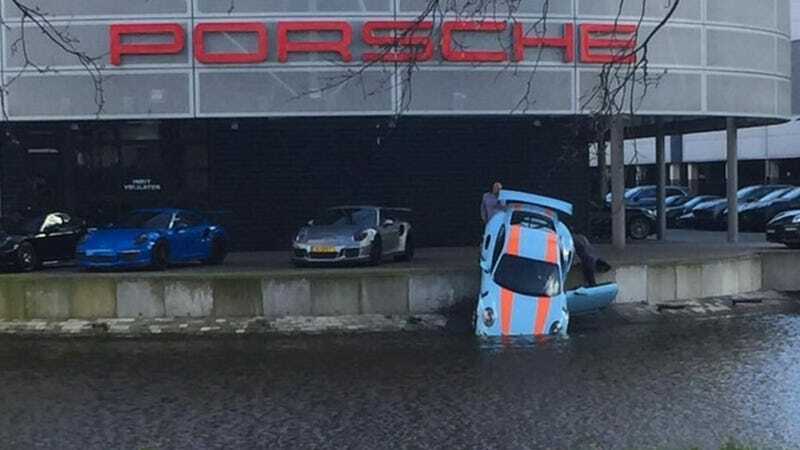 When I first saw the picture, I just assumed that the Gulf-liveried Porsche 911 GT3 RS was getting a little drink since, you know, Porsches are water-cooled now. Apparently, that’s not the procedure for filling the radiator tank, though, and this brand-new €250,000 car somehow just rolled into the water. Oops. The new 4.0 liter, 493 horsepower Porsche 911 GT3 RS is here, in all of its glory. Even better, this all happened in dramatically right underneath the huge PORSCHE sign at the Porsche Centrum Amsterdam, which I’m sure is fantastic publicity for the dealership and Porsche in general. I’m also sure that whoever made the call that, no, we don’t need any ugly gate on the edge of the parking lot, who’s going to be dumb enough to drive into the lake is probably pretty frustrated with everything right now. According to Van Veldhuijzen, the photographer who took all these striking images, the rumor is that the guy applying the stripe sticker package somehow let the car roll off the ledge into the lake, though other rumors say it was a mechanic. Either way, it appears that the GT3 RS rolled off as opposed to being driven off. That makes sense, because if you were going to drive that car off the edge, I’d think you’d want to really punch it at the end (because come on, you totally got this), and in that case the 911 would be much further out into the lake. The dealers told Veldhuijzen that the car actually sustained minimal damage (another big rear-engine advantage, people: much better recovery from rolling forwards into a lake) and the car will be prepared for delivery. Does the person who bought the car get any sort of we-sort-of-rolled-it-into-a-lake discount? I think I’d probably want something, just to compensate for that algae smell in the spare tire well.